If you have been trying for years to find a decluttering method, you can stick to this super simple yet highly effective decluttering method I am sharing with you today. 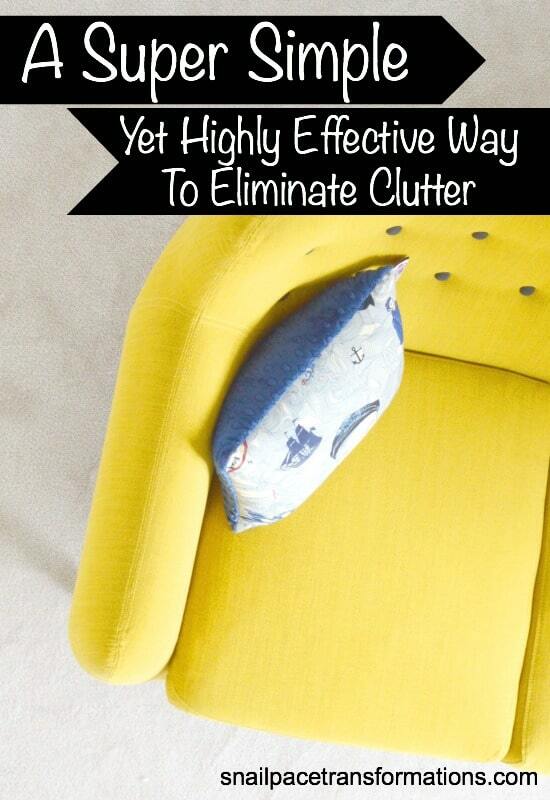 It just might be the simple plan that will help you kick that clutter for good. Pick a number of items to toss each day and then stick to that number each and every day. I did this for a month with Crystal of Money Saving Mom when she held a Clutter Busting Challenge one year. Essentially the challenge was to get rid of 7 items each and every day for an entire month. It made a huge difference in the clutter level in my home and was such a simple goal to stick to. 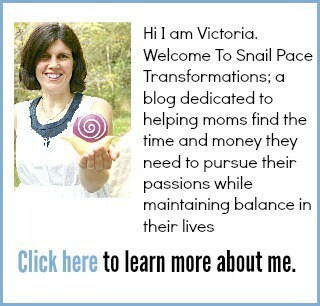 Currently there is a member of my Snail Pacing Clutter Removers Facebook group who is getting rid of 10 items a day. Her plan is to continue doing this until she can’t seem to find another item to toss. Then she plans to go back and organize what is left. If you really needed to you could hang a blank calendar on your fridge and put a big X on the days that you manage to toss your chosen number of items. Many people find this to be super effective for making a new goal a habit for life. No way! If your schedule is cram packed right now and just tossing one item a day seems right, then go for an item a day. 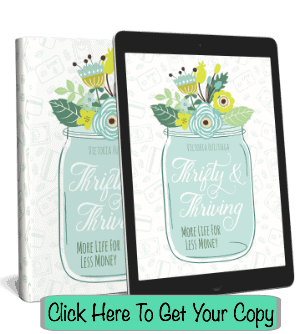 That is 365 items a year gone from your home and that can make a big difference. That is the power of Snail Pacing. Unless you did set your goal at one item a day, eventually using this plan you are going to have to begin to really dig for items and that could mean spending way more time looking for an item to toss than you did when you started. When this starts to happen to you it is not time to stop, but time to reduce your daily items tossed goal. Why not stop? In our modern world we are always bringing new items into our home. Attacking clutter must be a lifetime exercise if we want our homes to stay clutter free for good. So what is your number? Share it with me in the comments below. Need To Organize Your Days As Well As Your Home? The Make Over Your Mornings course can help! This course isn’t going to tell you to get up earlier. Instead it will help you start your day with intention so that your whole day runs more smoothly. Make Over Your Mornings will help you get organized so that you can finally find time in your day to reach for your goals and dreams. The course is reasonably priced and comes with a money back guarantee. Go here to read more about the course and get your copy! Feel like you would love to get rid of the stress your cluttered home is causing you, but you simply don’t know how you could squeeze time to declutter into your already cram packed life? I recommend taking Make Over Your Mornings and/or Make Over Your Evenings. These are 15 day, video driven courses that come with a workbook for you to complete. Each day’s lesson consists of a five minute video, five minutes of reading and a five minute workbook activity. The information I learned in the Make Over Your Evenings course gave me 30 minutes each and every morning without getting up earlier. 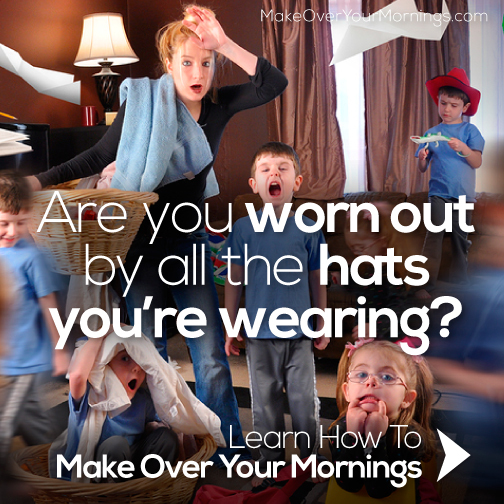 The Makeover Your Mornings course is just as full of great time saving advice that can help you carve out time to rid your house of clutter and finally make your home the haven you know it could be.